This website is not an offer to represent you, and you should not act, or refrain from acting, based upon any information on this site. Contact with this website does not constitute creation of an attorney-client relationship, and no attorney-client relationship shall occur until the client and the law firm sign an Agreement confirming the nature and scope of the representation. Further, this site is intended to comply with all Rules of Professional Conduct, and no attempt is made to seek clients from states other than those in which The Killino Firm, P.C. is licensed. 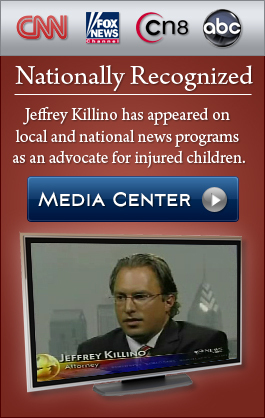 If you are not currently a client of The Killino Firm, P.C., any contact through this website will not be privileged. The Killino Firm, P.C. will endeavor to keep all communications through this website confidential. The firm does not disclose client information to outside parties other than in connection with pending claims and litigation, and in a manner consistent with applicable law. 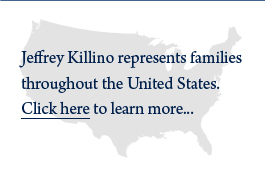 Because of the nature of communications through the Internet, The Killino Firm, P.C. cannot guarantee that any communications through this website will not be disclosed to third persons. The Killino Firm, P.C. regularly handles cases in New York, California, Pennsylvania, New Jersey and Florida and throughout the country by special admission in cooperation with other law firms.